Runners will start and finish the out-and-back course for the half at Nashville’s Bicentennial Capitol Mall State Park, marked by giant state emblem surrounded by flags and which gives visitors a taste of the Volunteer State’s history and natural wonders. The park commemorates Tennessee’s Bicentennial celebration in 1996. 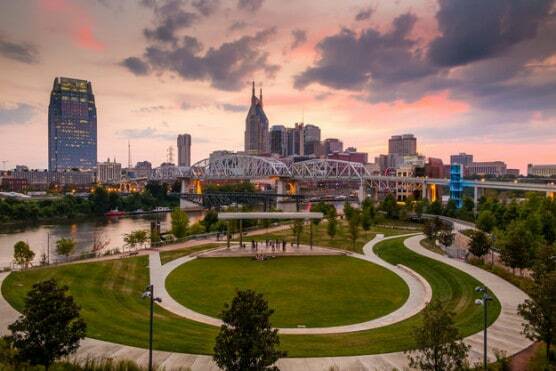 The mostly flat route will take runners past the historic Sulphur Dell area of downtown as well as the Nashville Farmer’s Market, the new Nashville Sounds ballpark, the picturesque Cumberland River Greenway, and Baptist Sports Park, which serves as the headquarters for the Tennessee Titans. The last five miles will treat runners to views of the Cumberland river which they will be running adjacent to starting around mile 8 all the way to the finish line. The course is extremely flat with one somewhat significant hill at mile 2.25, followed by a rewarding downhill. Runners will then be treated to an extremely flat and fast course for the remainder of the race, so be ready to stretch your legs and get your next PR! All half marathon finishers will be presented with this custom finisher medal that is in the spirit of and unique to Nashville, designed as a guitar pick. Also, runners can expect to have a text message from Race 13.1 with a link to the live results waiting for them when they cross the finish line, along with a first class post-race party. More than 1,500 runners are expected in the half marathon, so anyone thinking of signing up is encouraged to do so early. Located near the center of the state, about a two-hour drive north from Chattanooga, Nashville typically sees mild weather (and sometimes cool, especially in the early mornings) in late October, which has brought record temperatures here as low as 26ºF (in 1987) and as high as 94ºF (in 1953). On race day (Oct. 27), the average low is 45°F and the average high is 67°F. See the race route map for the Race 13.1 Nashville Half Marathon here. To reserve your spot in the 2018 running of Race 13.1 Nashville, TN Half Marathon, 10k, and 5K race, register online at the event website here. Ever run in the Race 13.1 Nashville Half? Share your impressions here, or post your review in the Comments below. Hi! Do you happen to offer a military discount code? Thanks! I’m 99% confident I have registered for the 1/2 marathon. Can you please confirm?